Justin Purser was commissioned to produce some exciting new signage for the front. 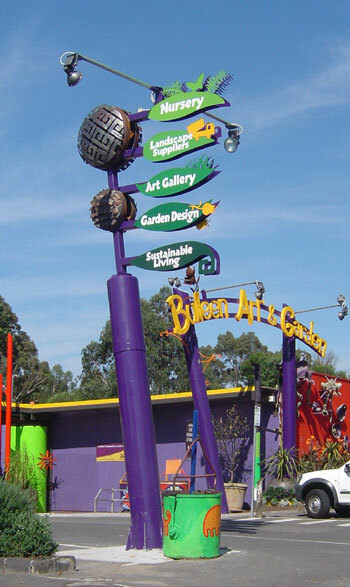 He has made large, decorative individually hand-crafted metal lettering which make up the Bulleen Art & Garden sign over the shop entrance. There is also a large pole with sculptural metal discs made from recycled metal for a directional sign on the other side of the drive. Justin has previously made large metal signs for seedlings, ferns etc to be found in the nursery. Melon Baskets Workshop Bolin Bolin Gallery – 20th Birthday this year!